The high quality valve ring KX-GT is made of graphite laminate with tang metal sheet inserts made of stainless steel. The valve is absolutely asbestos and maintenance-free. 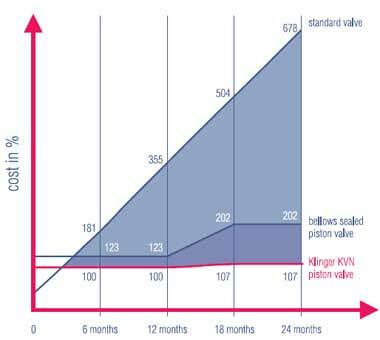 The variable thermal expansions which occur under alternating thermal loads are completely compensated by KX-GT-valve rings, which were presealed in a built-in condition. 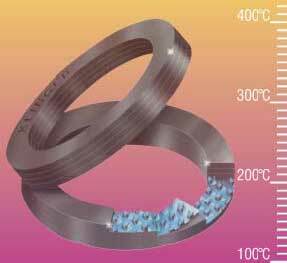 Media in the temperature range between –.40 °C and +.400 °C and at pressures of up to 63 bar, can be reliably controlled. KX-GT valve rings are excellent for the use in temperature shock operation as well as steam condensate alternating- operation. (Flash-application). In order to ensure convenient actuation at high differential pressures, the pistons of the KVN range are made of cast steel, whereof the sizes DN 65 to 200 are pressure releaved. The spindle is sealed with a gland and an additional valve ring provides the sealing between the body and the bonnet.